would like. They bring out our needs, anxieties, and conflicts with people from our past – parents, friends, and former partners. When we enter into a relationship we expect to be loved just for being who we are. A relationship should provide a safe zone where our partner values us for expressing our own uniqueness. This is a simple expectation. Indeed, this is the way most relationships start out. Why, then, does it seem so hard to maintain this ideal, blissful state of unconditional love over time? Our relationships with our partners are colored by our own personal legacies. We often react to our partners as if they were someone else – and this will likely cause conflict in the relationship. Children experience both good and bad in the world. Plenty of good experiences, like love and trust, feel comfortable and produce a positive self-image in children – a positive way of defining themselves. ...that projections are not at the root of every problem that couples experience. Sometimes one of the partners does indeed have a real behavioral problem. In this case, it is not advisable to try to understand it as a projection, but to see it for what it truly is and to take appropriate measures to change the situation. Working with a professional therapist is a good strategy for addressing relationship conflicts. An interesting phenomenon happens when a partner is the recipient of a projection – the one being projected upon. Because this person is trying to smooth out the conflicts, he or she may identify with the projection. So, the couple now begins to define their problem in this way. The person receiving the projection starts to say, “Yes, I have a problem with being too dominant, and I need to work on it.” In fact, this person may start to behave in a way that confirms the projection. It may never have occurred to this person that dominance was a personal issue in the past, but because it is brought up frequently through the first partner’s projections, the second person may create a self-definition that conforms to the projection. The recipient of the projection can either take in the projection – believing that it is true and behaving accordingly – or, in the more mature case, can modify it, insisting that the projection is not a true representation. In this case, the recipient can actually help the partner come to terms with his or her own issues and restore some health to the relationship. The person doing the projecting may define the whole of the other partner as having the problem, and the recipient of the projection may do the same – to define the problem not just as a part of the self, but the whole self. When this happens, the couple may forget about the positive parts of each of the partners and concentrate instead on only the problematic areas. The mistake here is this – when we work on our relationship conflicts, we need to draw on the positive parts of the relationship rather than focusing entirely on the problems. The process of projection in a relationship is not always one-sided. Things can get complicated when both partners are mutually engaged in this process – and this is a common occurrence. It becomes difficult for the partners to see where the problem lies. Take a look at the following example. Chris grew up in a household where the parents were emotionally withholding. Affection was seldom expressed toward Chris and the other siblings, although material needs were always provided. Chris always searched for nurturance, love and support, the things that were never provided in the household – and harbored some anger that the kids were never given these things. Of course, this anger was never expressed, for fear that it would lead toward even more emotional deprivation. Pat, on the other hand, had two very controlling parents. It was hard to experience independence during childhood, adolescence and early adulthood, and this led to hidden resentment that could never be expressed. When Pat and Chris first got together, they both felt liberated, as if all of their dreams and hopes for a relationship could be met in the other person. Chris saw in Pat a person who appreciated freedom and was genuine, affectionate, and willing to give love and emotional support. Similarly, Pat saw in Chris someone who valued love, trust, and respect for personal integrity. Their first year or two together were the happy times. Over time, however, Chris’s resentment, harbored since childhood and never resolved, became attached to Pat. Rather than seeing all the positive qualities in Pat that formed the basis of the initial attraction, Chris focused negatively on Pat’s need for independence and not being at home enough. Pat is accused of always being out with friends and finding the job more important than the relationship. Pat, on the other hand, sees Chris’s demands to be at home more often as control, the same thing that caused such resentment during Pat’s childhood. Rather than focus on Chris’s more positive qualities of love and trust, Pat accuses Chris of acting like a parent who would not allow independence. The couple is at an impasse. Chris accuses Pat of emotional withdrawal. Pat blames Chris for being controlling. They aren’t able to see their way out of their dilemma until they start to work with a therapist who is able to clarify the patterns. And for this couple – with some exploration, courage, and insight, there is hope. U nderstanding the sources of conflict in your relationship is one step toward resolving the differences between you. When we can get the problems out in the open and talk about them objectively, we can often find the solutions. Use the list below as a starting point for shedding some light on your relationship conflicts, which may now be hidden but which, with some thought, can become known and talked about constructively. •	Look for themes in your relationship conflicts, problems that keep reappearing time and time again. Focus on identifying the underlying theme in most of your arguments. Arguments usually focus on the surface aspects of the underlying conflict. Your goal here is to define the underlying conflict. •	Have these themes appeared in your other relationships with other people – both with friends and perhaps with other partners in the past? •	What are the positive qualities in your partner that you may have forgotten about as time has gone by? Can you begin to define your partner in those terms again? •	What are the negative qualities in your partner that cause conflicts between you? Does your partner agree that these qualities are true? Has your partner changed over time, gradually starting to agree that the negative qualities may be true? Or, conversely, does your partner insist that these negative qualities are not true? •	Do you focus mostly on these negative qualities when you think about your partner? 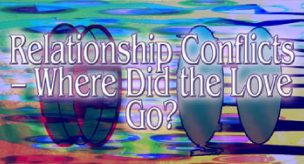 Relationship Conflicts - Where Did the Love Go?